Your book may contain notes, either as footnotes and/or endnotes, and possibly also refer to other works as references to items in a bibliography. If, like me, you have the ambition to present your e-book in a manner as close as possible to a print book, you will need to know the various conventions in use in the publishing industry and then adapt these for your e-book in a sensible way, taking full advantage of the format whilst also working around its limitations. This post covers how the notes should look. A further post will deal with how to make this happen in your e-book, using markup to make creating the links easier. Footnotes should be brief and relate closely to the text on the page. Endnotes can be more discursive although, if over-long, are perhaps better if worked into the main text. I should point out right away that, because there are no actual pages in an e-book, there is nowhere to put a footnote. It may in the future be possible to implement footnotes in an e-book as some sort of pop-up window, but that will depend on the roll-out of epub 3.0, the new epub standard. As the majority of e-book readers still rely on epub 2.0 documents, this won’t be happening any time soon. So in an e-book ALL notes to the text will have to be endnotes. That is, notes collected together at the end of either the chapter or the book. A note is cued by a superscript reference mark in the text. It is generally at the end of a sentence or quotation and is set closed up to the final punctuation (except a dash, which it should preceed). If the note relates to something specific within the text, then place it immediately after the relevant bit. Avoid putting note cues in headings. For endnotes the cue is usually an arabic number. For footnotes the cue is often a symbol from this list (and in this order) in Oxford style: *, †, ‡, §, ¶, ||, **, ††, etc. In Chicago style only *, †, ‡ and § are used. To enter these symbols in code view in Sigil, type &dagger; to get †, &Dagger; for ‡, &sect; for §, and &para; for ¶ (the pilcrow sign). You could use the double vertical line character (&#8214;) for ||, but I recommend typing two vertical line characters instead from the keyboard, as this will be clearer in most fonts. If you have decided to follow Oxford style, you will have to enter ¶ or || as ‘custom’ footnote reference marks in the footnote dialog. OR else just go with what MS Word offers and follow Chicago style. HOWEVER, as the footnotes will be converted into endnotes in your ebook, the foregoing is only relevant to your print book. It is included for reference only. If you are putting notes into your print book, you might find that MS Word spaces the lines with note cues in them a bit more generously than others. To prevent Word from doing this, make all lines the same spacing by selecting a ‘lineheight’ of ‘exactly’ so many points from the format paragraph dialog or (better) set this as your default style for ‘normal’ text. I would recommend making your life easy and going along with the formatting used by MS Word for footnotes (including the dividing line between the footnotes and the rest of the text, even though it does NOT follow Chicago style). If you are stubborn, like me, and wish to insist on the footnotes being done exactly as you want, then you may well have to copy and paste the footnotes as normal text at the foot of the page. Use a ‘text-wrapping break’ at the end of the main text and then paste in the footnote text. You will then be able to format it to your liking without Word getting in the way. OR you MAY be able to finesse the presentation by adapting the built-in styles used by Word. Obviously ONLY do this AFTER the book text is completely and irrevocably edited and the page boundaries cannot move. There are two issues to consider when placing and numbering endnotes. The first is the numbering. You might decide to restart the numbers for the notes at the beginning of each chapter. Or else you might decide to continue the numbering in a continuous sequence throughout the book. You can set either option in MS Word. The other issue is whether to place the notes at the end of the chapter in which they appear or else at the end of the book in a separate section in the end matter. In a book with chapters by different authors, Hart says it would be more appropriate to have the notes at the end of each chapter and I would have thought restarting the notes numbers at one in each of the chapters was also appropriate in this case. But for a work by one author, and in most other cases, the notes could go in a separate section in the end matter. If the note numbers restart at one in each chapter then you might want subheadings in the endnotes section to identify the notes to chapter one, notes to chapter two, and so on. In such cases, it is usual in a print book to change the running head at the top of each page to identify the pages or chapters to which the notes on that page refer. 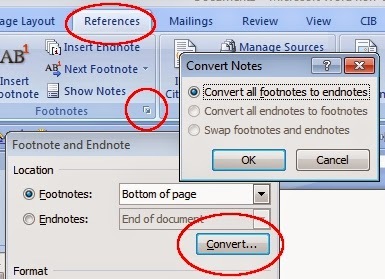 To do this in your print book, you will need to copy and paste all the endnotes into a new section and insert section breaks at the end of each page and then edit the running heads for each section. This is of course NOT possible in an e-book, although a subheading to identify the start of the notes to each chapter is still a good idea. In an e-book, it might also be a kindness to the reader to provide a clickable contents page at the start of the endnotes section, so the reader can easily locate the beginning of the notes to each chapter. Of course you could include links to each subheading in the notes section in the html table of contents, but that is getting a bit prissy. A separate contents page for the notes (located immediately before them in your e-book) would be a more elegant solution in my humble opinion. Make this following the guidelines in my earlier posts about how to create and style the html table of contents. You will need to add labels to each subheading in exactly the same was as I outline in those posts. A note will usually begin with a capital letter and end with a full point (full stop or period), whether or not it is a complete sentence. It is usual to set the text of the notes in a smaller font than the main text, although whether you decide to do this in your e-book is up to you. Another convention which is sometimes used is to print the word ‘see’ in roman type when the reader is directed to material outside the book, but in italic type when the reader is directed to material within the book. Again, whether to adopt this is a matter of editorial choice. Notes usually contain more abbreviations than the main text. Each note begins with the number of the note cue in the main text. In print books this is either superscript or on the line in the same point size as the text of the note. In which case it is sometimes followed by a full point. Whether you do that or not is also an editorial decision, although Chicago says always to use the latter method. In an e-book, the note cue in the main text will need to be converted into a hyperlink to the text of the note in the notes section.The reader would then either have to click the ‘back’ button on their e-reader to return to the main text, or else you could provide a ‘return’ link at the end of each note. However I don’t on balance think providing a ‘return’ link is worth the bother. I WILL, however, explain how to do this, just for the same of completeness. See my next post for details of how to do all of this using markup. Notes are commonly used to cite the source of a quotation referenced in the text. The general format for a citation in a note should be the same as it is in the bibliography (see a future post on the subject) BUT in the text of a note the first author’s initials should preceed the surname, in the usual way (surname LAST), whereas in the bibliography it is conventional to ‘invert’ the first-mentioned author’s name (surname FIRST), to help the reader look up the works by that author. A further convention generally in use in print books is that the first citation of a work in any chapter is given in full. Subsequent citations for the same work within the same chapter are usually shortened in some way. Although it is apparently becoming more common in some publications to shorten the citation in all cases wherever it falls. However this would require the reader to refer to the bibliography to find the full source and might not be appropriate in a print work with a lot of citations. Hyperlinking the shortened reference in the note to the full reference in the bibliography would of course speed this up in an e-book, making this objection only really of relevance to print books. I am not going to go further into the conventions for refering to a location within the work cited or the abbreviations commonly is use in citations. Refer to your style guide (New Hart’s Rules or The Chicago Manual of Style) for further guidance. Although it should be noted that an abbreviation at the beginning of a citation is usually capitalised, even if, in open text, it would normally be a lower-case abbreviation. But the exceptions to this in Oxford style are: c., e.g., l., ll., p. and pp. which should always be presented as lower case even if they begin a citation. A different referencing system in use in scientific publications is the Author-Date system. In this system, a citation is included in the main text as: (Shelton, 1980) or if necessary: (Shelton, 1980a) or: (Shelton, 1980 pp.12–34), or even worked into the text: ‘… but on the other hand Shelton, (1980), argues that …’. There is then less need for a separate notes section and the reader simply consults the bibliography to find the work cited. In a e-book, you would want to take full advantage of the format and turn the reference into a hyperlink directly to the bibliography, as there would in this case be no endnote to link to. IF the author-date system is in use, then the bibliography would usually be called ‘References’ and would only contain the works cited in the text (or notes). Any works consulted or suggested but NOT referenced in the text would, in such a book, be in a separate list, called ‘Further Reading’ or ‘Bibliography’. In a related system the author part of the reference is dispensed with entirely and the entries in the bibliography are just numbered in one long sequence. The cue to the reference is then shown by a number in square brackets in the main text. So, if you have numbered endnotes in the main text, these will all need to be hyperlinked to the endnote text, wherever it is. Short-form bibliographic references in the endnotes – or indeed in the main text if Author-Date or other similar referencing systems are in use – will need to be linked directly to the bibliography (or References section). Likewise, any work cited in a note should ideally be hyperliked to the entry for that work in the bibliography. I will explain how to use markup to link to the bibliography in a future post. This post has addressed the conventions around referencing in print books. My next post will explain how to link to the notes from the main text using markup in your e-book. Presentation is everything as it shows the quality of your work and also your hard work. Writing in this case also require best planning to write biographies. I believe writing your life story should be very easy and also must be based on truth.